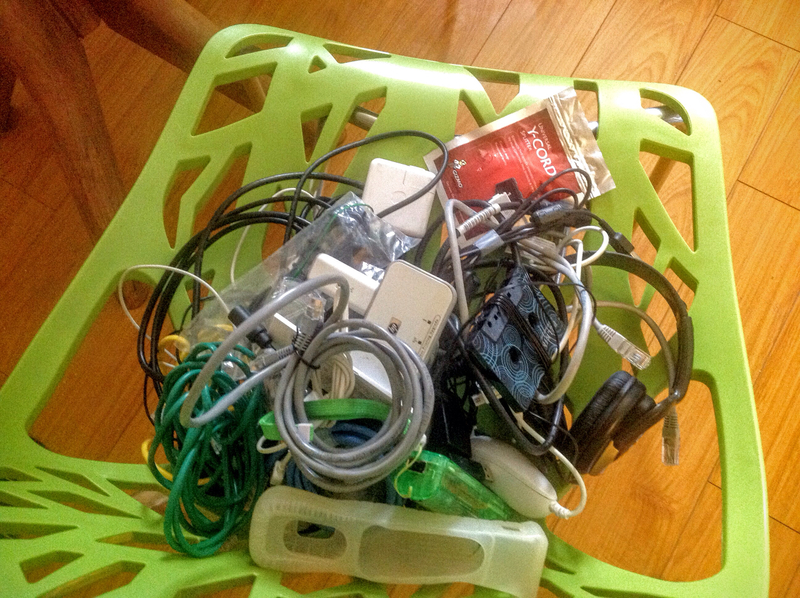 The "before" pile, all pulled from one drawer. 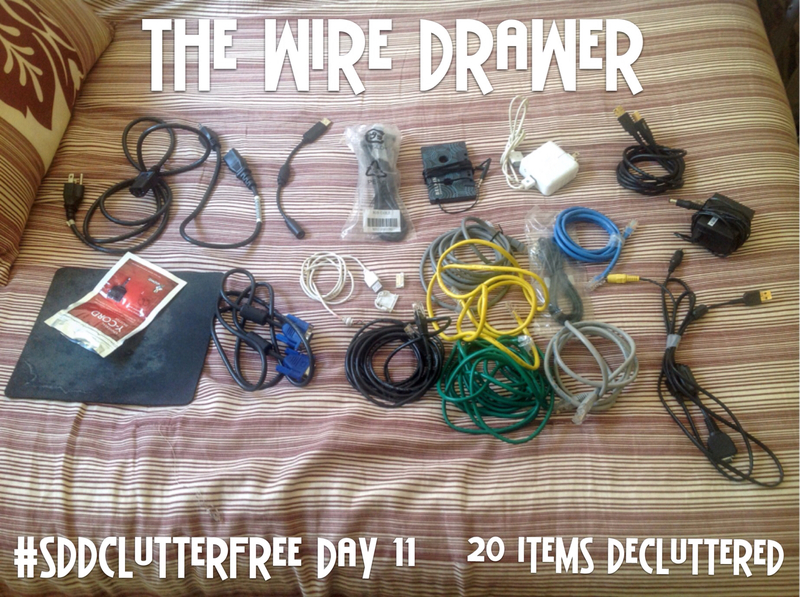 It's Day 11 of the So Damn Domestic Clutter Free Countdown, which means I got to declutter 20 items! I also really like the prompt today, which was to think about the benefits of making a big push. It can be hard to know when to go all in and when to take baby steps. I talked about it in A Bath of Ice Water, when I made a calendar of what my Dream Day would look like, and committed to it. If you dip your toe in ice water, you're going to pull it back out and say, "No way I'm getting in that!" If you dunk your whole body in, you'll adjust faster and, anyway, you made it into the water. Even if it's uncomfortable, you did it. From all my experiments trying to better myself, I think I've figured out when to go full-dunk and when to go slow. Baby steps seem to work best for establishing habits in any area where you feel shame or uncertainty. The ice water method seems to work best for building new habits in areas where you aren't ashamed but you know there's room for improvement. For example, I felt shame about my sleep, eating, and cleaning habits. I couldn't seem to get any of them regular, and it made it so much harder for me to function that I felt like a less effective/useful/worthy person. I had to practice self-compassion, forgiveness, and acceptance before I could make progress. To put it another way, I had to feel completely okay with how I was doing things already and then make small changes to create better habits. The Dream Day calendar did not work for me because it was too muddled with uncertainty, not only in the calendar itself (a dinner hour is great, but you gotta have a plan for dinner), but I also felt uncertain about my ability to pull it off. Building up routines in 1-hour increments is working much better. Alternatively, I don't have shame about my clutter. I have a healthy dose of Privilege Guilt, having an apartment to myself when my neighbors live six to a unit, but all it does is push me to be more mindful of my resources. I don't feel like my belongings define who I am as a person in a negative way. I'm also confident in my organizational skills, so that gives me fuel to get through a massive decluttering project like this one. I'm still taking baby steps in other areas of my life: routines, budget, skill-building. I mean, baths of ice water are invigorating and make you feel like a badass, but you have to go through discomfort to get to that awesome feeling, so I guess what I'm saying is: take the pressure off and choose a challenge for yourself that you know you're ready for. I'm also writing this to pat myself on the back for choosing the perfect challenge for myself. I believe celebrating accomplishments is a way to practice gratitude. I am rocking this Clutter Free Countdown! 1-7. Ethernet cables. HOW? WHY? Seven? 8. Phone or camera computer hookup. Doesn't belong to any technology I have, and didn't ring a bell with my brothers. 9. Power cord. Might go to a piano keyboard. I'm waiting for my brothers to check the keyboard at our parents' house tomorrow, but however it goes, it goes. 10. Printer cable. I just bought this a few weeks ago. Such a bummer it got crushed. I don't even know how or when it happened. 11. iPod charger. It's too old to charge my phone or tablet and I never use it for my old iPad because it works with the new chargers. 12. Cassette to ipod adapter, broken. 13. RGB cable. I'm using HDMI now. 14. X-box to USB adapter. I'll send this back to my brothers. 15, 16. Computer power cables. Everything's plugged in and working so I clearly don't need these. 17. Y-cord splitter packaging. Such a big bag for such a small item. I moved the splitter to where I keep my headphones, a more logical place for it. 20. iPhone charger smashed beyond repair. I'm keeping one USB-to-USB cord, one HDMI cord, the y-cord splitter, a wireless printer kit, headphones, and the Wiimotes. I'm not going to store them in the same drawer for two reasons. A. They don't need a whole drawer anymore. B. 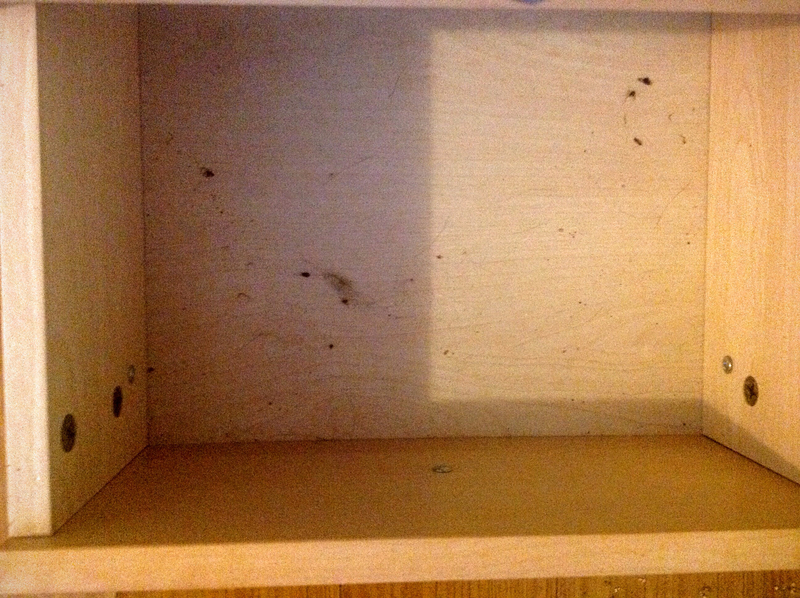 Seems these drawers have become quite the roach habitat! The two drawers left are full of placemats and plastic grocery bags. I'm disgusted to think how many roaches are living in there if any were in the boring wire drawer. I'll have to remove everything from that storage console so when I disrupt them, they don't disperse into my other belongings. It might take me some time to work up the courage.